PhotoShelter is developed and created specifically for professional photographers who are looking for a powerful online platform with which to grow their client base and sales, and extend their reach to more prospective clients and existing customers on the internet. PhotoShelter is currently used by over 80,000 photographers to run their photography business on the web. The software provides more than 100 tools, all designed to seamlessly integrate into your workflow to help you save significant amount of time, make your images more useful, and easily meet all your client and sales needs. PhotoShelter is intended specifically for professional photographers who have a huge inventory of high-resolution imagery that needs special care. 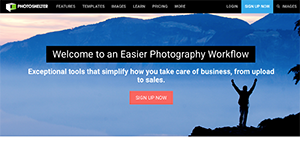 PhotoShelter is a premium website builder designed and created specifically for professional photographers who are looking to grow their base, significantly extend their reach to more prospective clients, and steer their photography business towards their goals. Currently used by more than 80,000 photographers, PhotoShelter has been featured in The New York Times, Digital Photo Pro, Professional Photographer, and a few other popular photography-focused resources, a clear indication that the software is a legitimate application that professional photographers must have. It boasts a backend engine designed to give users full control of their photography business. With the software, photographers can easily sell prints, packages, digital downloads, and royalty-free or rights-managed stock photos, and effortlessly receive payment for their work via payment gateways such as PayPal, Stripe, Authorize.net and Netbilling. Users can quickly upload all their photographs on to their cloud-based storage which they can access from anywhere, any time. There is no upload size limitation so they can virtually upload huge pictures into their cloud storage without having to reformat or resize their images. The platform also makes it easy for users to share their images with the public, or set sharing setting to private and send them to prospective customers. The platform also offers an automated print and product fulfillment process, plus watermark functionality to protect photographs. If you are considering PhotoShelter it might also be a good idea to analyze other subcategories of Best eCommerce Software collected in our base of B2B software reviews. Each enterprise is different, and can call for a special eCommerce Software solution that will be adjusted to their company size, type of clients and staff and even particular niche they cater to. It's not wise to count on getting a perfect services that will be suitable for each business no matter what their history is. It may be a good idea to read a few PhotoShelter reviews first and even then you should remember what the software is supposed to do for your company and your employees. Do you require an easy and intuitive service with only basic features? Will you actually make use of the complex functionalities required by experts and big enterprises? Are there any specific tools that are especially practical for the industry you operate in? If you ask yourself these questions it is going to be much easier to locate a solid solution that will match your budget. How Much Does PhotoShelter Cost? We realize that when you make a decision to buy eCommerce Software it’s important not only to see how experts evaluate it in their reviews, but also to find out if the real people and companies that buy it are actually satisfied with the product. That’s why we’ve created our behavior-based Customer Satisfaction Algorithm™ that gathers customer reviews, comments and PhotoShelter reviews across a wide range of social media sites. The data is then presented in an easy to digest form showing how many people had positive and negative experience with PhotoShelter. With that information at hand you should be equipped to make an informed buying decision that you won’t regret. What are PhotoShelter pricing details? What integrations are available for PhotoShelter? If you need more information about PhotoShelter or you simply have a question let us know what you need and we’ll forward your request directly to the vendor.